While giving up numerous foods due to Celiac or a gluten allergy is par for the course, chocolate does not have to be one of them. 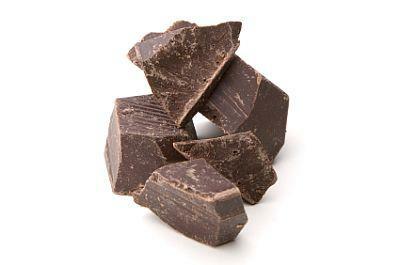 Chocolate itself does not contain gluten and is safe for consumption in its pure form. Unfortunately, many types of chocolate may contain gluten due to additives or contamination in the way they were produced. In its purest form, chocolate is exclusively derived from products of the Theobroma cacao tree. Baking chocolate and cocoa powder are both pure chocolate, and as such are naturally gluten-free. Are Nestle's Chocolate Chips Gluten Free? Does Ice Cream Have Gluten? Malt: Most often a barley derivative, malt can appear under a number of names. Watch for malt extract, malt syrup and malt flavoring. Modified food starch: Starch can come from any grain source. When in doubt, avoid chocolates and candies that list modified food starch as an ingredient. Artificial flavor or extract: Many of these ingredients contain gluten-based grain alcohol and are best avoided. Caramel color: This may contain gluten, depending on the manufacturing process. Dextrin or Maltodextrin: In the United States, dextrin must be manufactured using corn. Imported foods that list dextrin as an ingredient may contain gluten. Even high quality chocolate with only the purest ingredients listed on the label may contain gluten as a remnant of the manufacturing process. A conveyor belt on the production line may have been dusted with flour to prevent sticking, a mould may have been coated with flour, or the chocolate itself may have been treated with starch to keep it smooth and fresh in the package. Manufacturers are not obligated by law to disclose these trace amounts of wheat products, so they will not necessarily appear on the ingredient list. When in doubt, contact the manufacturer directly to determine whether their particular product contains gluten. The surest way to know whether your chocolate contains gluten is to make it yourself. In the safety of your own kitchen, you can tailor the recipe to suit both your dietary needs and culinary preferences. This is an especially useful solution if you have other dietary intolerances such as nuts or dairy products, or if your chocolate requirements outpace your budget for fine chocolate. When your health depends on the answer, be sure you ask the right questions. Each brand of chocolate, as well as variety within brands must be treated as a unique case. Careful label checking and detailed questioning of manufacturers will allow you to enjoy your favorite chocolate with an easy mind. When you no longer have to worry about whether a product will cause a reaction, you can relax and indulge in the simple pleasure of a good piece of chocolate.